SBK Fast Dates Superbike Calendar Kitten Gemma wants to take you for a ride! SBK World Superbike Fast Dates Calendar Kitten Katie gets up close and personal with Chris Vermuelin's Ten Kate Honda CBR1000RR at Brands Hatch. Click any picture for a bigger screensaver image. Heading our list of "must haves" is this beautiful conceived 2-wheel spped device premieredrecently at the International Motorcycle Exhibition in Italy. 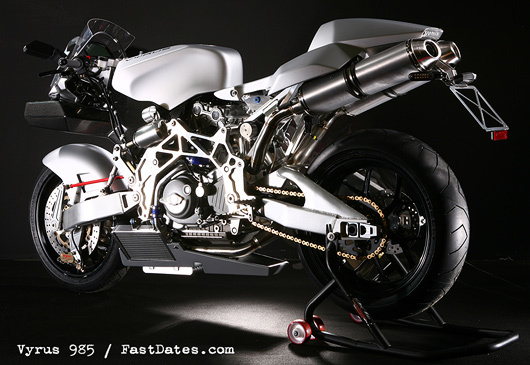 With its curiously stripped-down appearance, the Vyrus 4v is one of the most distinctive bikes on the planet. Given that the exotic Italian machine weights a claimed 157kg (346.1 lbs.) 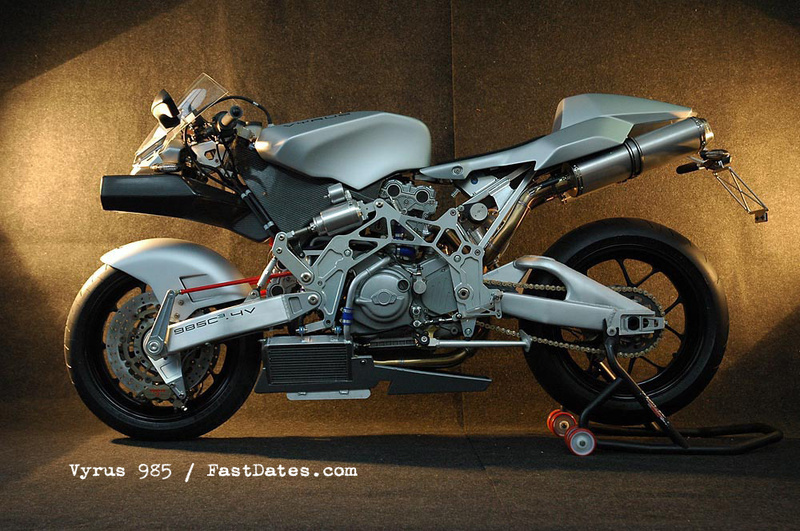 dry and is powered by the 150 bhp four-valve V-twin engine from Ducati's 999R flagship, there also not much doubt that it's also one of the fastest. 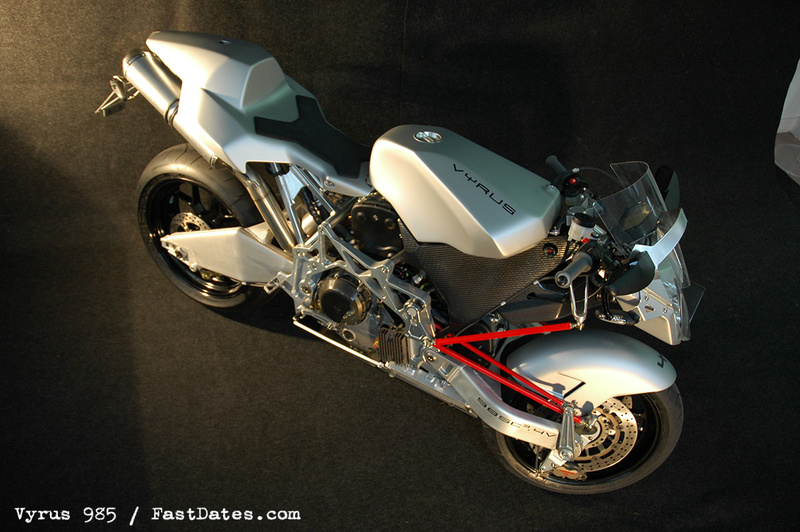 Why cover it up with a fairing when you have fascinating engineering and design to display. The strange, insect-like shape of the Vyrus might be vaguely familiar, even if its name is not. 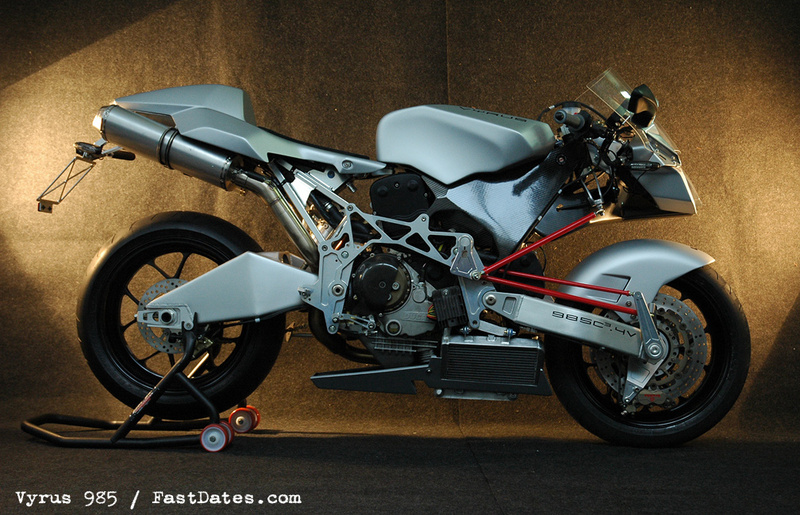 Two years ago Bimota unveiled a V-twin, The Tesi 2D that looked very like this. 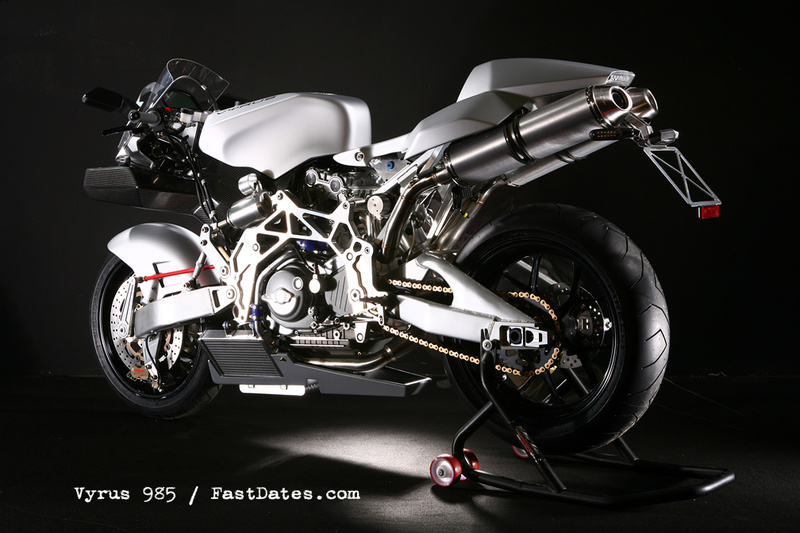 It was powered by Ducati's 992cc air cooled Monster engine, and had a chassis based on that of the Tesi 1 D, the revolutionary hub-center-steered machine whose failure bankrupted Bimota a decade ago. This bike is similar, but different in two key respects. 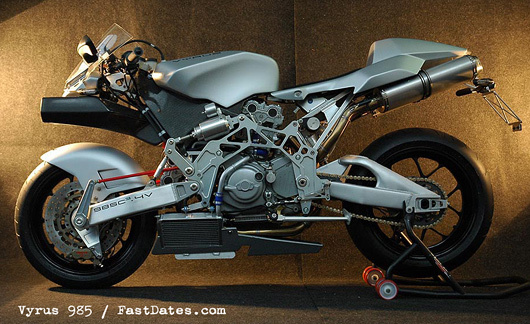 Firstly, its being sold under the name Vyrus - the firm that built both this bike and the Tesi 2 D (though few of those were sold). Vyrus run by racer/engineer Ascanio Rodorigo, is a Rimini-based outfit whose total staff of just five makes even Bimota seem huge. Secondly, Ducati's 999R lump is much more sophisticated, and nearly twice as powerful as the Tesi 2D's humble air-cooled unit Vyrus buy motors directly from Ducati, and pause only to unbolt the protruding standard water pump (which is replaced by an electric pump) before bolting the 999cc V-twin into the minimalist aluminum frame. Does It Feel As Extreme As It Looks? The unusually slender aluminum top yoke has just a bolt-head sticking up on either side, rather than a telescopic fork-top poking through it. The clip-on bars are wide and quite low, giving a conventional sports bike-riding position. If you glance down to your right you can see a red steering rod. 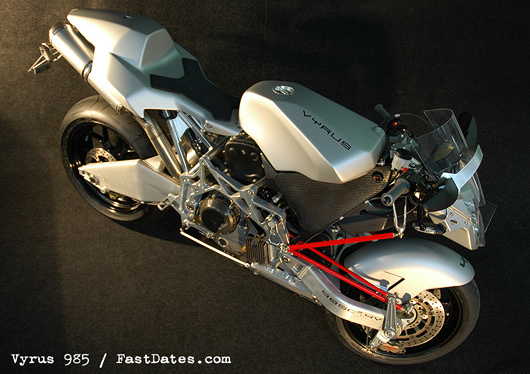 0n the left a large carbon air duct stretches forward past the headlight; the front shock sits in front of your shin. The highly-strung Vyrus sounds angry even at a standstill as its high compression Desmo motor snarls through those carbon cans. When you pull away, that sound is joined by a sharp screech as the Ducati's dry clutch struggles with the 999R's tall first gear. But once into its stride the Vyrus is very fast and responsive. Ducati's hopped-up 999R motor is wonderfully flexible, so I don't have to pay attention to the tacho That leaves more time to concentrate on the chassis, which performs well. In hairpin bendsyou are conscious of the handlebars actually turning, because the Tesi-style steering linkage doesn't give a direct 1: 1 ratio between bar and front wheel movement. It isn't a problem, just strange and something I'm sure you'd get used to before long. At higher speeds the cornering feel is more linear and the handling is superb, notably in the way that the reasonably soft front suspension carries on working if you brake hard into bumpy bends, keeping the bike very stable. The Vyrus's exceptional suspension control under pressure also allows maximum use of its non-radial four-caliper Brembo system, which is more than adequate for such a feather-light bike. The air shock at the rear also does a good job, keeping the bike taut and stable when accelerating hard out of turns. Hold those clip-ons tight when I hit the occasional straight stretch and the Vyrus growls for-ward with fierce and seemingly never-ending charge. Occasional wheelies are irresistible, and inevitable given its weight and a wheelbase of just 1375mm. When Can I Get One And What Will It Cost? Assembly of the first batch is well under way with a couple of bikes already built. 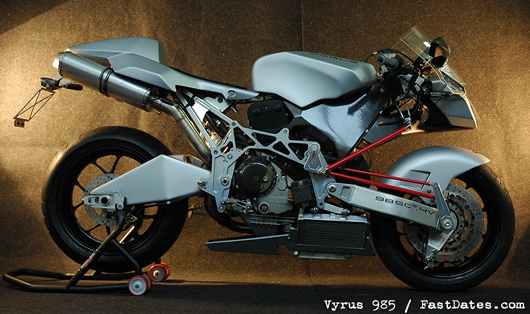 The small number of Vyrus 4v machines that will be produced this year will cost about £38,000 ($70,000 USD). At that price he's very aware that every detail has to be absolutely right. 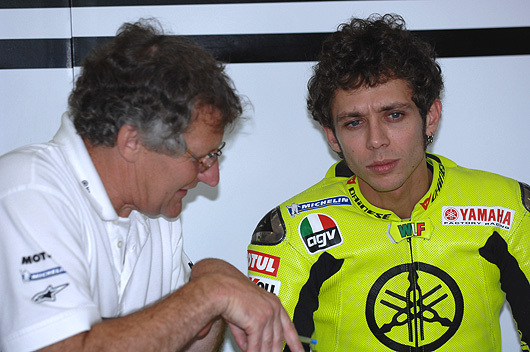 Thursday, 1st February 2007 - Yamaha Motor Company Ltd and Valentino Rossi have announced they will continue to race together until the end of the 2008 season. The next two seasons will see Rossi ride as part of Yamaha’s Official Factory Team, with which he has already won two MotoGP World Championship titles since joining the Factory in 2004. The Italian, who turns 28 this month, has won 25 Grand Prix during his three seasons with Yamaha and currently stands third in the all-time Grand Prix winners list. Rossi, who is spearheading the rider development of Yamaha’s new 800cc motorcycle in the run-up to the new MotoGP season, will be back in action next week for Yamaha’s second test of the year in Sepang, Malaysia. “I’m very happy I renewed the contract with Yamaha until the end of 2008 so now I can just concentrate on racing this season” said Rossi. “I think that last year, when we fought back from what seemed an impossible situation to come so close to taking the title, showed what a fantastic team we are and this is why I want to stay with Yamaha. The past three years with Yamaha have been very positive and this is why I am pleased to stay. The atmosphere in our garage is always relaxed and happy and I think that this is something very special and difficult to find. I have great faith in Yamaha and I am very excited about my future and the future of the 800cc bike with them. We are ready to challenge with the new 800cc and now this agreement gives us the chance to launch this challenge for the next two years”. 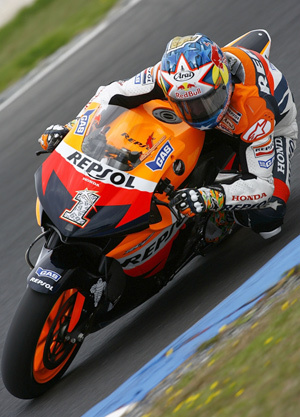 Monday 5th February - Four teams and seven riders were on track today in Malaysia, for MotoGP’s second visit to Sepang of 2007. The teams absent from last week’s Australian excursion all continued their 800cc development in the customary humid conditions, in the first of three testing days. Both Yamaha factory riders took the early initiative in Asia, with Colin Edwards and Valentino Rossi at the top of the timesheets. Edwards put in a lap of 2’02.175 on the latest version of the M1, edging out team-mate and five-time MotoGP World Champion Valentino Rossi by under 5 hundredths of a second. The Italian, who committed his future to the factory for the next two seasons last week, rode the fewest laps of any rider on day one, completing just 40 circuits. Kawasaki’s Randy de Puniet was the only other rider to break the 2’03 barrier, albeit over half a second slower than the two official Yamaha representatives. 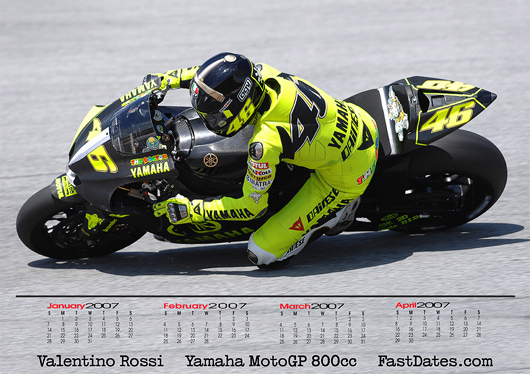 The Frenchman grafted hard on the opening day, and put in over twice as many laps as Rossi on the Ninja ZX-RR800. As he continues to adapt to the Yamaha M1 with Dunlop tyres, a product of his switch this season from Luca Montiron’s Michelin-shod Honda team, Makoto Tamada was fourth fastest, ahead of the French duo of Olivier Jacque and his fellow Yamaha Tech 3 rider Sylvain Guintoli. The Japanese rider already went quicker than at the opening test of the year in January. Ilmor, making their first appearance outside of Europe, only bring rider Andrew Pitt to Sepang for this week’s proceedings. His team-mate Jeremy McWilliams is still on the mend after surgery on his leg, and is expected to return to action for the Official Test in Qatar. Pitt put 49 laps worth of miles on the Ilmor GP bike’s clock, adding to the small number he was able to undertake in Almeria last month. Phillip Island, Australia - Thursday 1st February - MotoGP’s Australian preseason testing excursion drew to a close today, as the majority of the premier class teams concluded their three-day test at the Phillip Island circuit. Riders from Ducati, Honda, Team KR and Suzuki have been putting the new 800cc bikes through their paces since Tuesday, aiming to gather vital new data and experience before the 2007 season kicks off on March 10th in Qatar. World Champion Nicky Hayden was the outstanding rider of day three, topping the timesheets with the fastest lap of the test. Despite admitting earlier in the week that work would still need to be done to adapt the bike to his physical requirements, the Kentucky Kid didn’t seem to be too hindered on the RC212V’s final run-out of the week, clocking a 1’29.52 lap which signalled Repsol Honda’s first top spot of 2007. With no Team Yamaha and Day 2's quickest Team Ducati doing race simulation, Honda's Haydon (1) and Pedrosa posted the quickest times. After yesterday’s Ducati dominance, The Ducati Marlboro Team didn't focus on posting the quickest times, but has concluded working on race setups. Loris Capirossi and Casey Stoner did not complete as many laps today as the set-up of the Desmosedici was already at a good point, so both riders concentrated on testing the new Bridgestone race tyres and successfully concluded a 20 lap race simulation. The new qualifying tyres on the other hand did not resolve all the problems on the difficult Australian track but the data accumulated today will be fundamental for Bridgestone for development work. The Ducati Marlboro factory team and the Pramac d’Antin satellite outfit were tightly packed together on the timesheets, with Capirossi and Stoner only slightly quicker than Alex Hofmann and Alex Barros. 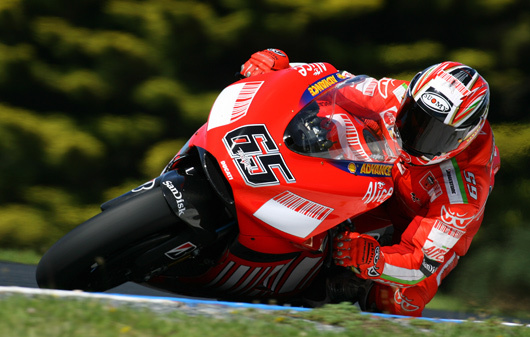 Brazilian veteran Barros went quickest on the first two days of testing in Australia, and the fast times from all four Desmosedici GP7s show that the new Ducati will be a competitive ride in 2007. Loris Capirossi on the new paint scheme Marlboro sponsored works Ducati. With the new European TV ban on tobacco adverting beginning this year, we may not even see the sponsor name "Marlboro" appearing at Asian MotoGP rounds like in China, now the largest new market for cigarette companies. Loris Capirossi (34 laps, best time, with race tyre, 1m30.14s) - "These have been three positive days of testing. Since last week in Malaysia we have improved the set-up of the bike a lot and now we know that we are in good shape both here at Phillip Island and at Sepang. If we confirm these good sensations in the next test in Qatar and Jerez we will be satisfied and could be competitive throughout the entire championship. Today we did a successful race simulation. I really liked the new tyres brought by Bridgestone and I am already in good shape with them even though it was the first time we used them. The information accumulated in the long-run will be useful for their development but I am really pleased with the work done. With the qualifying tyres on the other hand we haven't yet resolved the problems that we had here last year, but we are on the right track and I am sure that we will resolve these as well. A big thanks to the guys in Ducati Corse who have done a great job this winter and to my team who as always have been fantastic!" Casey Stoner (40 laps, best time, with race tyre, 1m30.21s) - "Yesterday we were satisfied with the bike, so today we didn't do any more work on the set-up and concentrated on the race simulation which went well. I was able to lap at a good pace and I set some good times without pushing that hard, so I'm really satisfied! It was very useful to do a simulation to really get an idea of how the new Bridgestone tyres perform and I think that with the information we accumulated today the Japanese technicians will have enough data to continue the development of the new race tyres, which have great potential. I like the bike more and more and it's great working with this team! The qualifying tyres didn't perform as well as we expected but at this time of the year it's right to focus on the race set-up, and I'm really pleased with that. Now I'll be staying a few days in Australia before leaving for Qatar, a track that I really like and where I can't wait to test with the GP7". LCR Honda’s Carlos Checa cut four tenths of a second off his time from yesterday, and luckily was untroubled by seagulls today. The Spaniard was a victim of a low-flying attack on Wednesday, which contributed to the red flag being shown and a short delay to the session. He was just faster than Gresini Honda rider Toni Elias, with Rizla Suzuki’s local rider Chris Vermeulen still unable to find a way to push the GSV-R800 up the timesheets at a track which they traditionally don’t enjoy. The Australian finished ahead of Marco Melandri and team-mate John Hopkins over a second behind Hayden’s final day time, with Shinya Nakano and Kenny Roberts Jr rounding off the list of participants. Left: Hayden jokes with Roberts Junior. The next test is scheduled for Qatar from 13-15 February, where all the MotoGP teams and riders will be present. The factory Yamaha team, in addition to satellite outfit Tech 3, will be on track alongside Kawasaki Racing and the first appearance outside of Europe for the Ilmor Team. Further details from Australia, and coverage of next week’s proceedings, are available at motogp.com. As usual in such cases, no information was disclosed as to why the Eckle team was terminated from their MotoGP contract with the Kawasaki factory. Before entering MotoGP 3 years ago, Team Eckl formerly ran the official factory Kawasaki World Superbike team. Feb 1st 2007 - Rizla Suzuki MotoGP has completed the second test of the 2007 season at Phillip Island in Australia, having accumulated large volumes of important data for the forthcoming season. Chris Vermeulen shaved nearly two seconds off his lap-times over the three days and completed his fastest ever lap of the circuit, with a 1’30.30, during his 79 laps today. The Australian star was returning to Phillip Island for the first time since last year’s wet race and set about the task of improving the new GSV-R800 to make it competitive in dry conditions at the 4.4km track. Vermeulen worked tirelessly with his crew throughout the test and completed a total of 207 laps. They tested many new chassis settings and refined the engine mapping to make the bike more rideable for the difficult and demanding Australian circuit. By the end of the third day Vermeulen and his Crew Chief Tom O’Kane were only making detailed changes to the bike and they are sure they will be in a much stronger position when the team return for round 16 of the MotoGP World Championship in October. John Hopkins was pleased with the test but frustrated with his end result, and believes he can find more from the GSV-R when the team return to race. He clocked up 55 laps today and recorded his quickest ever lap of the circuit with a time of 1’30.60. His team worked thoroughly throughout the test and managed to make many improvements that will assist the GSV-R to also perform at a higher level elsewhere. He conducted similar tests to Vermeulen, as he too set about the job of making the new bike fully competitive at all circuits. Chris Vermeulen: “When we first got here on Tuesday we struggled quite a bit, but we did expect to really. We had a similar problem to that which we had at last year’s race weekend here and the bike was quite hard to ride without spinning the tyre – that obviously affected the durability. We worked a lot on that, both with chassis settings and engine mapping over the week and it got a lot better as time went on. I improved my average lap time by about one and a half seconds over the three days and that is quite a big step! I also did my fastest ever lap around Phillip Island. I also tested a new heart monitor while I was out riding the bike, this will help me to see how I can improve on my fitness over a race and show me how my body is reacting to various situations on track. So all-in-all it was a pretty good test. We have still got quite a long way to go around here but the progress we have made at Phillip Island will hopefully help us at other circuits and make the bike work even better." John Hopkins: “Basically we have done a lot of laps, and although we found a lot of positives we didn’t end up getting exactly what we wanted from here. We sorted out some of the engine mapping and power delivery issues, but this test has been a bit of a reality check. We did struggle over the three days and it showed we still have a bit of work to do on the bike before we come back here for the race in October. I still have some things to sort out with my own riding round here as well, and they can’t be fixed overnight – I also have to improve at Phillip Island, not just the bike. I am now really looking forward to getting out in the desert in Qatar, we had a good 990 set-up for there and the bike usually feels good. I’m certainly looking forward to riding the new 800 there and getting back to the sharp end of the timesheets! Cupertino, CA (January 31, 2007) – Ducati North America announces today several internal promotions and new appointments that are strategically designed to support continued commercial success in North America. A total of six new positions have been created and filled. Jason Chinnock, who was recently an Area Sales Manager covering the Midwest, has been promoted to the position of National Sales Manager. In this newly created role Jason will oversee all aspects of Ducati sales in the United States. Filling Jason’s position will be Elliot Cho, who comes to Ducati from the HMC Supermoto Team, and who has significant experience in the motorcycle industry. Elliot will start with Ducati on February 1st, 2007. On January 1st, 2007, the Ducati North America MRP Department name was officially changed to “Ducati Performance,” which will allow for a stronger focus on the performance and accessory business. Supply Chain Manager Dimitre Dimitrov has been promoted to the role of Ducati Performance Manager, where he will be responsible for sales of both accessories and apparel to authorized Ducati dealers. Supporting Dimitre will be two brand new positions (and new hires) - Accessories Manager Jon Bekefy and Apparel Manager Georgina Colvin. Both Jon and Georgina come to Ducati with existing motorcycle industry experience. The Business Development and Marketing departments will also benefit from some internal promotions and new hirings. Sian Goad has been promoted to the position of Advertising and Brand Manager, where she will oversee branding initiatives and all advertising work. Kristi Blanchard has been promoted to Network Development Manager, where she will have a direct impact on how the brand is received and promoted in dealer showrooms. John Paolo Canton has been hired to fill the position of Public Relations Coordinator and will be responsible for all media communications and press activities. Tuesday 30th Jan - Telecom Italia's ADSL brand Alice will continue to be title sponsor of MotoGP’s Gran Premio d’Italia and Grand Prix de France until 2009 after extending an agreement that has already seen them present at the prestigious events for the past two seasons. Italy’s leading telecommunications company signed the new agreement with MotoGP’s commercial right holders Dorna Sports, giving Alice the benefit of a complete sponsorship package that includes not only the right to name the events, but also trackside brand exposure presences, corporate hospitality and promotional activities in the public area. Therefore, the races scheduled for the world-famous Le Mans and Mugello racetracks will be officially called “Alice Grand Prix de France” and “Gran Premio d’Italia Alice”, scheduled respectively for May 20th and June 3rd – the fifth and sixth rounds on the 2007 MotoGP calendar. The new deal also includes a track signage package at several races through the year, boosting Telecom Italia and Alice’s presence in MotoGP, which also exists through their sponsorship of the Ducati factory team. Hebron, Ohio, February 3, 2007 – The Pegram Racing/Leo Vince Ducati Team announced a new program where fans can sponsor the team and automatically qualify to win prizes donated by the team’s sponsors. First prize is a VIP weekend for two at the US MotoGP at Mazda Raceway/Laguna Seca. The package includes VIP passes to the races, hotel accommodations for three nights, access to Red Bull VIP hospitality, two bike passes to Ducati Island and lunch with Michael Lock - CEO of Ducati North America. Travel not included. Other prizes include Leo Vince full exhaust, Scorpion helmets, Fieldsheer leather jacket, Sidi boots, front and rear stands from Power Stands , Motul Oil, gift certificates for Triangle Cycles.com, and several others.